The expense of repairing or replacing brakes on your Jaguar can be alleviated if you perform regular visual inspection of the brake system. In addition to saving a few dollars, you will insure that your fine ride remains safe! By letting the initial tell-tale squeal continue without a full inspection/repair, you may well be setting yourself up for a major repair bill. Once you suspect that noise may be caused by worn brake pads take your car to the Everett Jaguar Repair & Service Experts for Everett, Lynwood, Mukilteo, Snohomish and Edmonds, Washington. Remember — the sooner, the better when it comes to brake wear and tear! 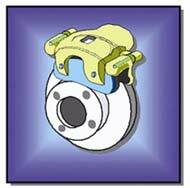 Brake Pads — visually inspect every brake pad (2 pads/rotor/disc) for excessive or uneven wear. If indicated, replace the pads; some models of Jaguar have a brake pad sensor–these should be replaced each time pads are replaced. Brake Rotors/Discs — because Jaguar uses minimal thickness rotors to decrease vehicle weight, they cannot be machined from wear. As such, the rotors are more susceptible to heat damage and pad scoring. Should visual inspection indicate scoring or discoloration, the rotors must be replaced! Brake Drums (if applicable) — inspect visually as with Rotors/Discs for signs of excessive wear and heat fatigue. Rhythmic Thump — could be caused by a rotor that is worn unevenly or warped; you will also notice that the brake pedal thumps or vibrates (in extreme cases). Constant Noise — definitely a sign that your Jaguar is in desperate need of a brake job! At the first sign — visual, audible or tactile — of brake distress, have your Jaguar’s brakes repaired immediately! Delay will only wind up costing more as the worn pads continue to damage the rotor beyond a useful state and the hydraulics suffer by trying to compensate for the pressure adjustment. Sound advice: have your brake system inspected every time the oil is changed!